Paul Ervin was an active member of the Comox Valley community as a coach, volunteer and athlete. Upon retirement from the Canadian Air Force, Paul’s wife Bonnie bought him his first pair of running shoes. Little did they know then how this pair of shoes would change their lives. Paul joined the Comox Valley Road Runners, swam with the swim fit gang and became an avid participant in Rob Sykes’ spin classes. 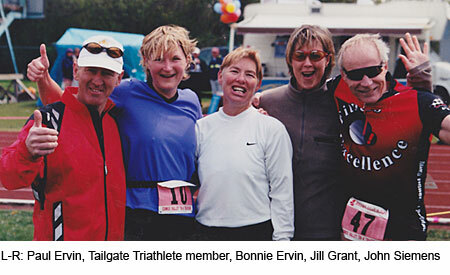 Along with friends, Paul and Bonnie formed the Tailgate Triathlon Club. It was only 12 members strong but for many years they trained and traveled to many races together. Another member of this club was their good friend, John Siemens. Participating in Triathlons became a lifestyle for the three of them. They enjoyed the competition and camaraderie of many like minded people. It was not about winning or placing at races, but rather the journey. Although Paul and Bonnie competed in many different races, sprint and olympic distances, the local Tri-K Triathlon was, and still is for Bonnie, their favorite. Unfortunately Paul suffered a heart attack during the memorial run for his good friend John Siemens and passed away July 21, 2004. Paul’s friends have donated a trophy in his memory to the Shoreline Tri K Triathlon that is annually awarded to the top junior male triathlete. After career’s with both the Canadian Air Force and the Coast Guard John Siemens retired and became an avid triathlete. He began as a runner with the Comox Valley Road Runners club and the River Rats. John soon met participants of the successful Swim Fit program coached by Sandy Riley at the Comox Valley Sports Centre. This active group of people found their way to Rob Sykes’ spin classes and in no time they were entering triathlons with John’s first race being the local Tri K Triathlon. Along with good friends, Bonnie and Paul Ervin, and a small but dedicated group of athletes the Tailgate Triathlon club was formed. This group combined their love of competition and adventure and began to travel all over British Columbia competing in Sprint and Olympic distance triathlons. John excelled in these competitions and was selected to the Canadian National Triathlon team and competed in France and Japan. In 2001 John completed his first Ironman Canada Triathlon in a time of 14:55:30. He returned to the Ironman Canada in 2003 and improved his time to 14:16:39. John’s dream was to participate in Ironman Kona but sadly he passed away suddenly May 3, 2004. He will be remembered by all who knew him as a fun loving man with a contagious laugh. Chances are you have seen the bench in front of Quality Foods Comox that is dedicated to this gregarious man. Friends have donated a trophy in his memory to the Shoreline Tri K Triathlon that is annually awarded to the top female triathlete. The Al Pullin trophy will be awarded annual to the school that supports the Shoreline Orthodontics Tri-K Triathlon by encouraging participation in the event and promoting active lifestyles for its student body and teaching staff through training sessions and ongoing support. Al Pullen was instrumental for years in getting students involved in participating in the Tri K. As an administrator he found it the perfect event to involve participation of all students from kindergarten through to grade 6. Al would help students form teams, set up swim sessions with the local pool and ensure funding was available to any student who wanted to participate. Whatever school Al was working at would win the school participation trophy. The year he would switch to a new school there would be a fantastic rivalry as students from his previous school would rally to beat the participation level of students at his new school. Al became a committee member of the Tri-K Triathlon Society and served in this capacity for many years. He can frequently still be heard as the MC of the event or cheering on participants from the side lines. Lorne Franks was one of the first triathletes in the Comox Valley. His passion for the sport was infectious and he encouraged participation of many others. Sadly, he was killed while on a training ride shortly before a Tri K Triathlon. His friends and family have donated trophies in his memory which are awarded each year to the top local female and male athlete. Mark Adams emigrated from the UK to give his wife Helen and two kids, a new beginning in Canada. They moved to the Comox Valley and very quickly became involved in the local community. Mark was a member of the Race Committee of the Tri-K Triathlon Society and participated in the family team category. He passed away suddenly in December 2006. His family have donated a trophy that is awarded annually to the top family team.